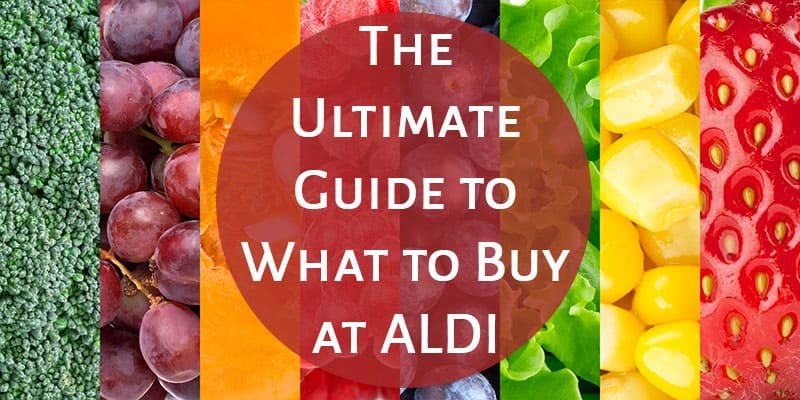 Question: What should I buy at Aldi? Some people have a view of Aldi that their food is sketchy or scarier than the food at any other grocery store and it’s just not true. You won’t recognize any brands or packaging at Aldi because they have their own brands that are “private label”. Their private label foods are just as good, if not better than name brands and popular store brands. It’s good stuff! 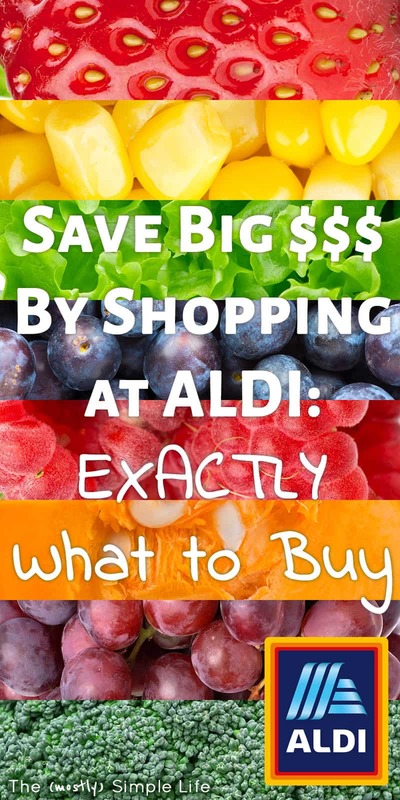 We save a ton of money by shopping at Aldi. The prices are insanely good. If you spend hours couponing, you might be able to get a better deal on a few things somewhere else, but for the average shopping cart full of food, you’re going to save a ton of money. I found a study that compared Aldi prices to Walmart prices(here) and found you could save up to 30% by shopping at Aldi! That means if you spend $100 on groceries per week, you could save $30 every week. That’s $1560 a year! I like to shop at Aldi because it saves me a ton of time. The store is set up so that you pretty much move in the same direction as everyone else and zigzag through each isle on the way to the checkout. You can make one pass through each isle, grab what you need and you’re done. Plus, you don’t have to look at 15 different brands of ranch dressing trying to decide which to buy. They have about one or two varieties for each product. You know you’re getting a good price, so you can walk by and grab what you need. No need to compare prices on different brands and see what’s a better deal. It’s quick. We live about 45 minutes from the nearest Aldi, so I make a huge list and try to stock up on everything I can for the month (I have to make a weekly fruits and veggies stop somewhere for the rest of the month). It took me less than 45 minutes to get through the entire store and check out with a month’s worth of food. That same trip would have taken twice as long anywhere else. Well, I stand by my first statement. Buy everything at Aldi. Try it all! The only thing we have found that we don’t care for at Aldi is their version of Rice-a-Roni. Everything else we’ve tried has been good. 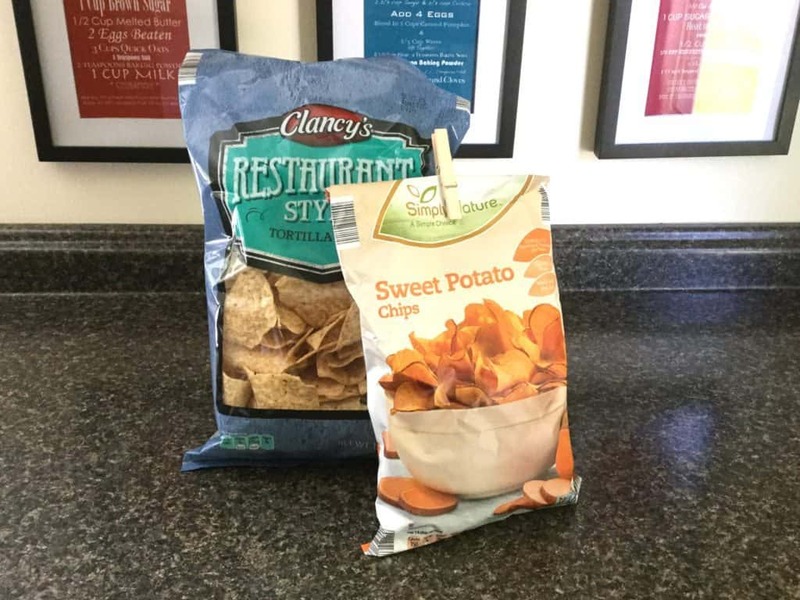 I’m slightly addicted to their sweet potato chips and we always buy the restaurant style tortilla chips. 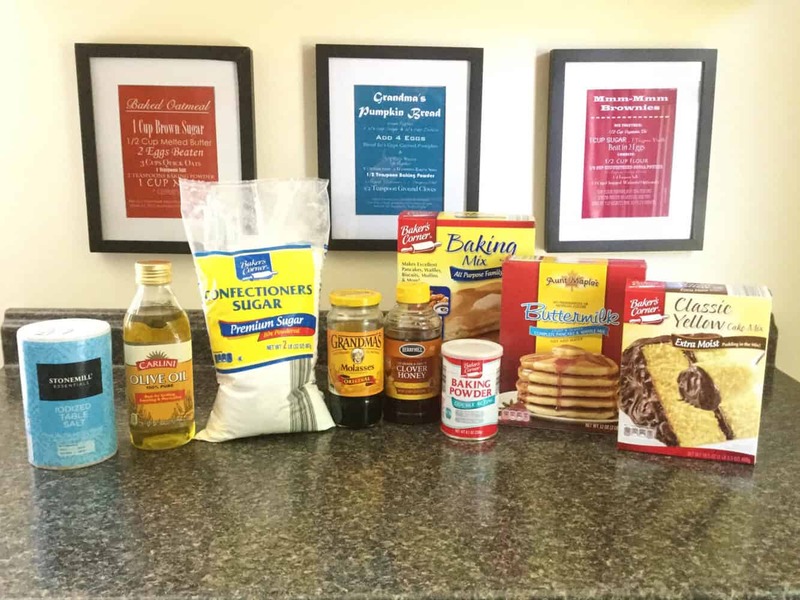 I buy all of my baking supplies there: Flour, sugar, powdered sugar, brown sugar, baking soda, baking powder, cocoa, chocolate chips, nuts, salt, and molasses. I also buy pancake mix, baking mix, and cake mixes at Aldi. They have really good olive oil and extra virgin olive oil for cooking as well as honey at a good price. We use Aldi’s balsamic vinaigrette as a chicken marinade. 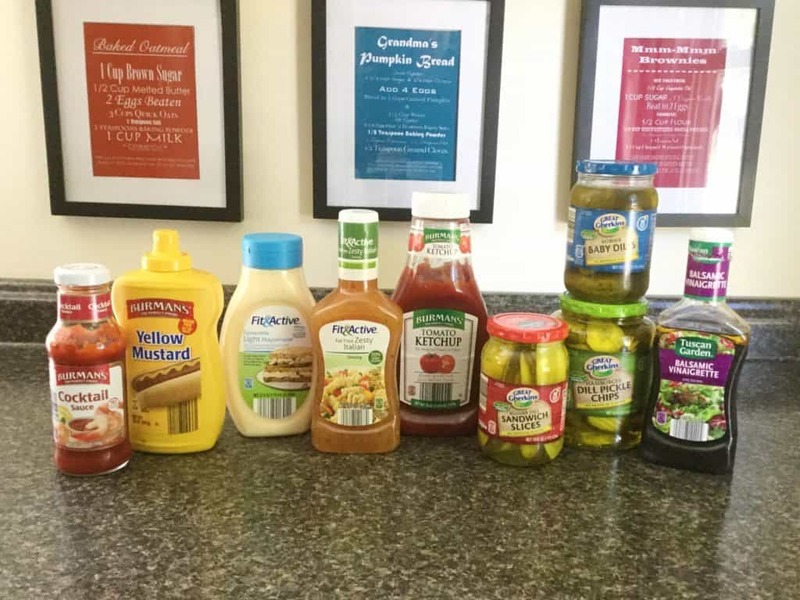 We buy salad dressings, mustard, ketchup, pickles and light mayo there regularly. You can’t beat the price or quality at Aldi for light sour cream, cream cheese, and ranch veggie dip (my favorite). On occasion we’ve found better prices on cheese at other stores, but if it’s not on a really good sale, Aldi has a good price that’s at least better than Walmart. I buy cases of diced tomatoes and diced tomatoes with chilies every few months so that we always have what we need to make my blender salsa. 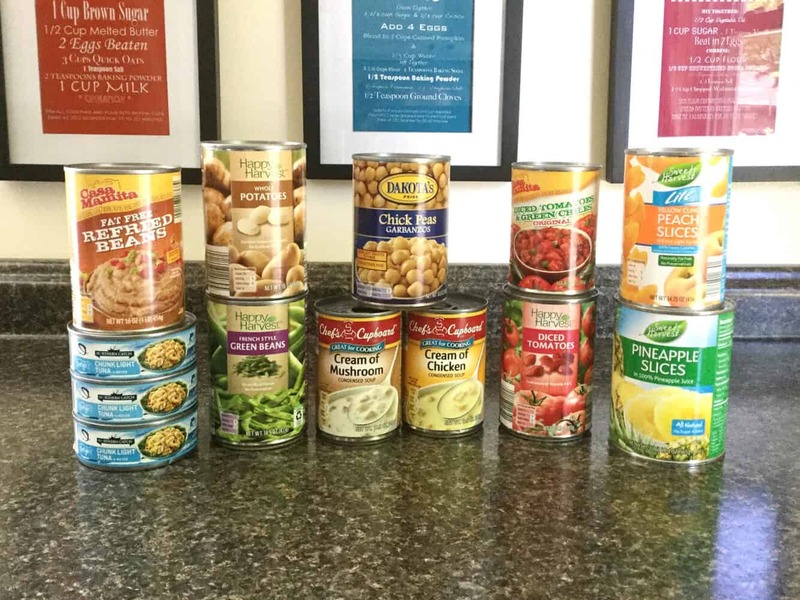 We also get canned veggies, cream of mushroom and chicken soups, and fat free refried beans. Oh, and chickpeas too so we can make our own hummus. You can’t beat the Aldi price for hotdog and hamburger buns. We also buy their 12-grain bread. They have an amazing price on boxes of pasta. 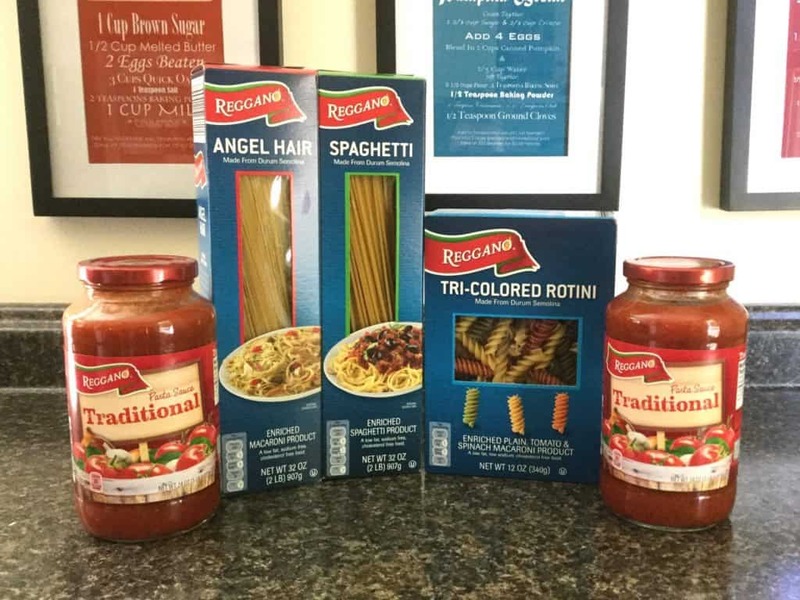 We stock up on spaghetti and angel hair noodles, plus rotini to make pasta salad. I love Aldi’s pasta sauce, and I’m pretty sure you couldn’t make your own for the price they sell it. I like to check the specials on meat. I got a good deal on chicken breast this month. I love their frozen burger patties. You can throw them on the grill still frozen with a little seasoning and they cook up fast. 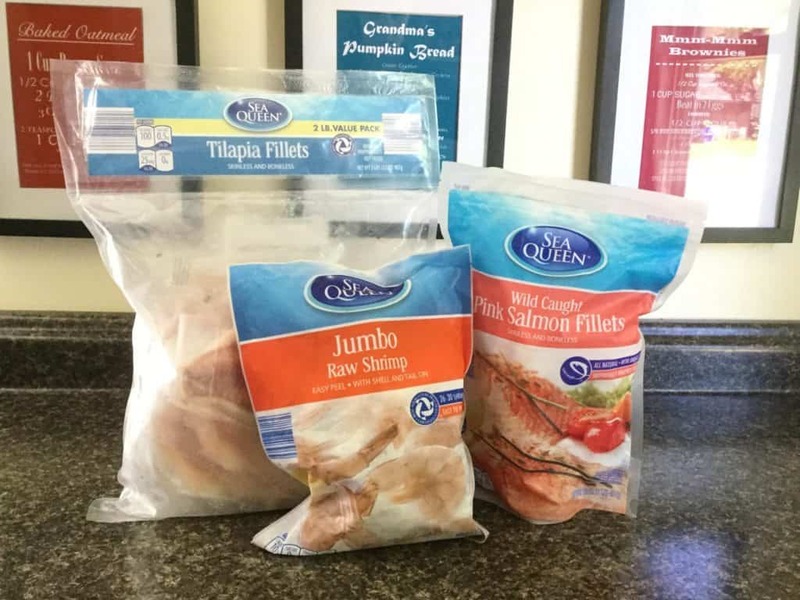 We regularly buy bags of frozen salmon and tilapia at Aldi. We also buy frozen shrimp. All of the Aldi stores around here have great quality fruits and vegetables. I buy as much as I think we can use before it goes bad and then I have to shop elsewhere until my next Aldi trip. In the fall, you can get a great price for canned pumpkin. I stock up for the whole year because they can run out of it and I use it to make chocolate muffins throughout the year. Around Christmas they get in cheesecake samplers that are delicious. Also, look out for the spiral honey-glazed hams. They always have a better price than anywhere else and they are so good. 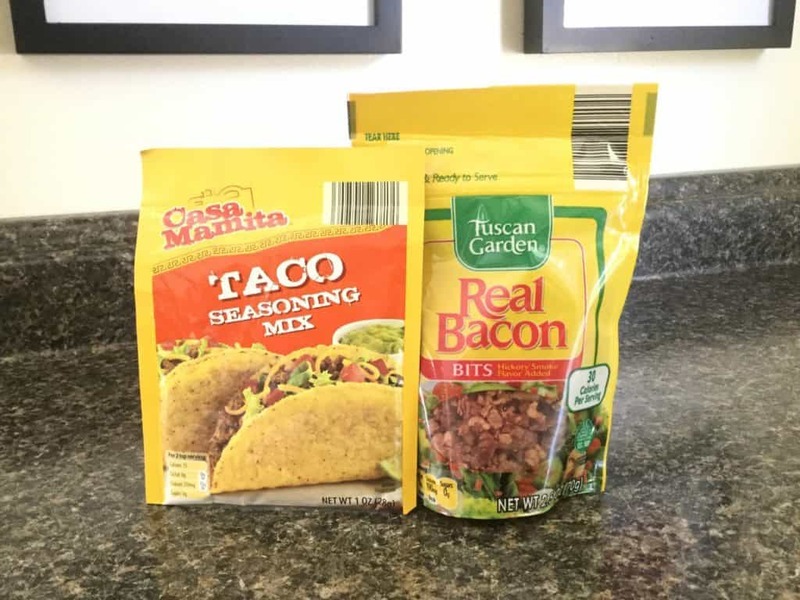 This may seem odd, but I always keep a stock of Aldi taco seasoning and bacon bits. We like the taste of their taco seasoning better than any other brand. As a bonus, it’s only 35 cents! The bacon bits are the real ones, not the weird fake-o kind. They are such good quality and we prefer them to name brand bacon bits. 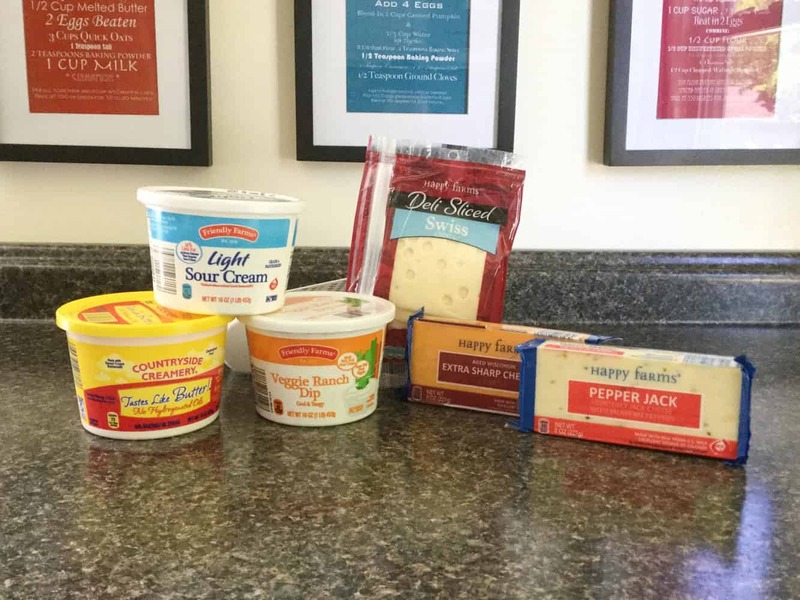 We use them on pizzas, quesadillas, salads, homemade mac & cheese, all kinds of stuff. They add a lot of flavor. 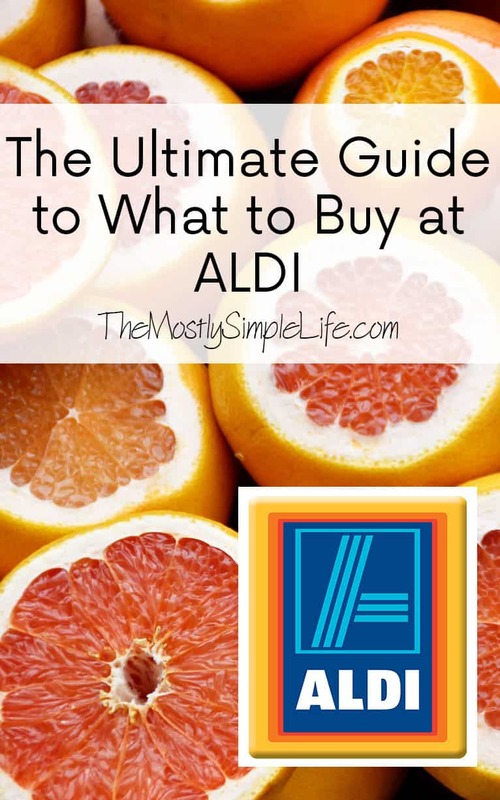 ⇒ Are you an Aldi shopper? What are your favorite things to buy there? I love Aldi! I agree; buy everything! I can go without a list and grab everything that catches my eye and still spend less than the most miticulously planned shopping trip somewehere else. I want to try Aldi! But we shop in Lidl which is very similar. I love it! I love the lack of commercial products shoved in your face. I’ve never heard of Lidl. Sounds great! Frequent shopper of Aldi! Well I pretty much shop in all kinds of stores, I just try to know where to go for what! But Aldi is always a good place in general, and here in Ireland they have loads of fresh fish and meat as well, which I didn’t have that much in Belgium. Wow! That’s awesome! We just get frozen fish here, but it’s hard to find fresh fish anywhere. I wish there was an Aldi where I live! I hear so many great things about them. The closest we have is Walmart, but I don’t really feel like I get my bang for my buck like I used to. My parents just moved out west and they are missing Aldi. It stinks to have to pay so much when you know there are places less expensive! I’ve heard such good things about Aldi but the one time I went, they didn’t have bananas which are a PRIMARY for my shopping staples. I have bought almond butter there before though and that was really good! That’s funny. They must have been out. You should try again, the Aldi stores around here always have bananas. I’ve never had almond butter, but I’ve wanted to try it. I’ll see if I can remember to get it next time. I shop at Aldi for everything except for paper towels, toilet paper, and cleaning supplies. I also don’t buy my fruits and vegetables there, because I had some go bad on me quickly a few years back. But with them starting to provide organic options, I’m going to have to try buying my produce there again! I wonder if their organic produce will last longer. The Walmart by us has terrible fruits and veggies, so I try to buy a lot at Aldi. Ok, so I loved shopping at Aldi in Europe, and didn’t even know it was in the US. Now, they are starting to pop up all over. I have still not shopped at one yet in CA, but since I’m moving to Chicago tomorrow, I know I’ll have them all over! I can’t wait!! Thank you for sharing! Good luck with your move! I hope you find an Aldi close! Christine you are SO lucky to have an Aldi’s! I live in Arizona and the closest thing we have in comparison here are Winco’s 😛 Luckily though, whenever my Husband and I go visit his family in NY, we get to experience Aldi’s magic. So affordable! I know! We drive 45 minutes away once a month to get to it, but it is so worth it! I think our pantry and fridge probably look almost identical. 🙂 I love love LOVE Aldi! We are about 30 minutes from the nearest store and it’s the main place I do my once-a-month shopping. My husband won’t use anything but their 12-grain bread for sandwiches and we’ve gotten addicted to the tortilla chips in the big bag. Per ounce they are about the same price as the smaller bags, but we like them better for dipping in salsa or eating plain. We still like the tortilla chips in the smaller bags better for nachos. I just love that I can get everything and not have to spend 2 hours shopping and waiting in the checkout line like a typical trip to Meijer. That’s awesome Julie! They have such good food! I have never shopped at Aldi because it’s never been a convenient store to shop at. However, I think if I adjust my commute home after work I would pass one of these stores. I want to at least browse around the store at some point to get an idea of what their prices are like. I live a large metro area though so pricing is higher than suburban areas regardless, but I still want to give Aldi a try. Thanks for the tips! I think no matter where you live, Aldi prices will be way lower than what you’re used to paying. I hope you try it! I will let you know once I do! I loved reading your article! We shop at Aldi also. When I say we, I mean my husband and I. He goes more than I do! He plans out our trip every week, with our stash of reusable bags and grocery list, which he makes most of the time. His best friend shops there, too. Sometimes they go together, it’s hilarious! He says it’s a man’s dream grocery store. It’s smaller, fewer items to have choose from, good quality food, and excellent meat. I’m not complaining! We love Aldi! My daughter is gluten-intolerant, therefore she eats gluten-free. Aldi has THE best assortment of G-F products around! Pastas, frozen foods and baking mixes. I made brownies for her, replacing the flour in my recipe with the LiveGFree baking mix, she ate the whole pan! Gluten-free cooking is tricky, but Aldis makes it better! I could go on and on, but your readers should just try it for themselves! Oh, and their premium ice cream, with only 5 ingredients is the best, and least expensive around! Yay Aldi!